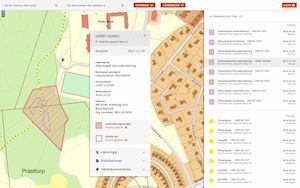 Digitising the Archaeological Process at the Swedish National Heritage Board: producing, managing and sharing archaeological information. Larsson et al. Internet Archaeol. 43. 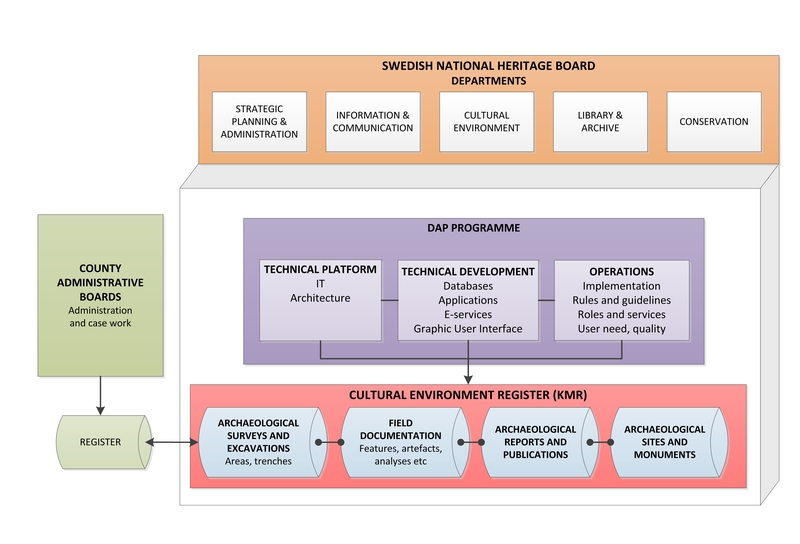 In 2014 The Swedish National Heritage Board (NHB) initiated the 5-year Digital Archaeological Process (DAP) programme in order to create a more seamless process for storing and sharing digital information generated through archaeological surveys and excavations. The programme aims to increase the availability of digital data as well as the quality and usefulness of the information. Our goal is to facilitate more effective heritage management in Sweden, of benefit to regional agencies as well as contractors working with the environment, industry, building and development planning in general. In the process the information will also become more readily available to researchers, museums and the general public. The DAP programme consists of several contiguous projects developing various solutions. Some of the projects are mainly technical, such as building a new IT platform and e services, while some focus on the practices through which people should compile, describe and share information. The projects are interconnected via their members, reference groups and steering committees, ensuring that technical development is grounded in the reality of the archaeological process, as well as meeting the requirements of the intended users (Figure 1). Figure 1: Types of information produced by archaeological fieldwork, and where they end up in the current system. While Swedish National Heritage Board maintains the Archaeological Sites and Monuments Register and an Open Archive of archaeological reports, presently these two are not interconnected. Digital field documentation has not been consistently collected from the contractors up until now. In Sweden all building plans must be approved by the region's County Administrative Board (21 in total), who is responsible for making sure ancient and historical sites are protected. The administrators may decide that archaeological surveys and preliminary excavations are necessary to ascertain the presence of such sites within an area, and then for the sites to be fully excavated and documented before building commences. Contract archaeology is carried out by museums, private companies, foundations or consultants. It is the County Administrative Board that decides who gets the assignment; however, the developer must cover the actual cost. The increased number of archaeological contractors since the 1990s means that it is not always easy to establish what has been done where, when and by whom – knowledge that is essential both for planning how to proceed and to avoid doing similar fieldwork twice. Official forms summarising site information are to be sent to the NHB to be entered into the Archaeological Sites and Monuments Register, which has been publicly available online since 2006. Additionally, the fieldwork reports are to be published and the NHB receives a copy of these. Since 2013 the reports are also made available in PDF format on the NHB Open Archive. The artefacts, together with the original field documentation (drawings, field notes, photos), are to be delivered to a national or regional museum. Only analogue documentation is archived in the current system; however, over the past 20 years field documentation has become predominantly digital and georeferenced. Not only does this mean that the original sources are not archived, but valuable information is lost when it is transformed into publications and illustrations, even if these are perceived as 'digital' (i.e. PDF, JPG etc.). Instead of administrators and archaeologists building on syntheses of previous results when planning new projects, substantial time is lost re-digitising the information in printed maps and tables. For museums the acquisition of finds has become increasingly time consuming as well, since it often involves manual re-registering into their own collection system. 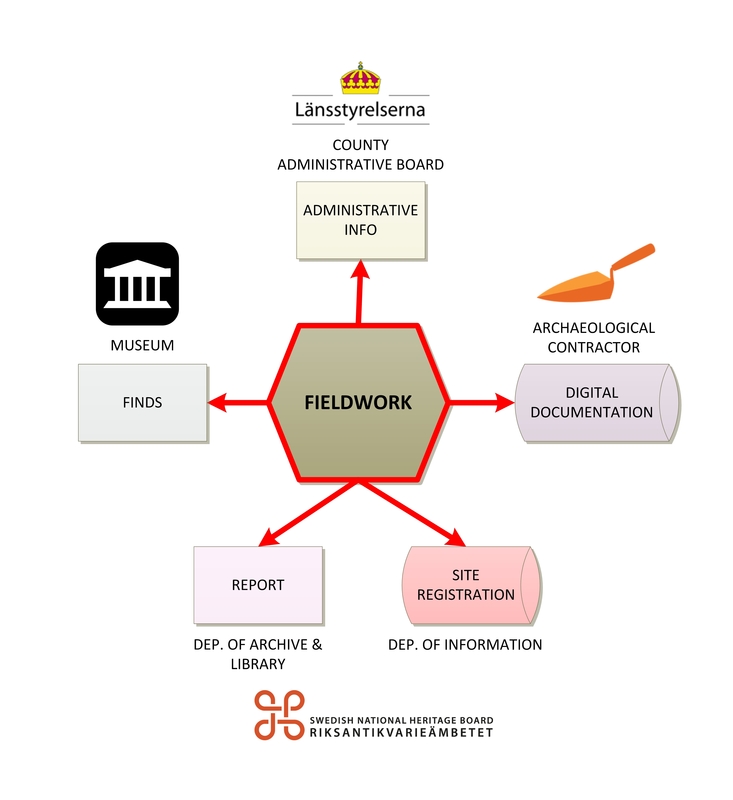 For the collections to be of use to researchers as well as curators, it is important that the artefacts do not lose their connection to the context in which they were found, so access to field documentation is essential (Riksantikvarieämbetet 2016c). Another problem involves the accuracy, or lack thereof, of the information in the Sites and Monuments Register (Sohlenius 2014; Riksantikvarieämbetet 2016a; 2016b; Törnqvist and Lindeberg 2014). As the annual number of archaeological projects has been increasing in tandem with an expanding society over the past decades, it has become difficult for the NHB to keep up with the information that needs to be added to the Sites Register. This involves not just registering new places, but also updating known ones that have been wholly or partially excavated, or have been damaged by some other event. There are over 600,000 culture historical places documented in the Site Register today, but not all of these are protected by law as they do not meet all the criteria necessary to be deemed of historic or prehistoric importance. Forestry in particular, which is an important part of Swedish industry, needs accurate and up-to-date information to comply with the law requiring them not to damage ancient sites. Since the map is digital it suggests a high degree of accuracy in the position of the sites shown there. However, many of the sites were initially marked by hand on maps from 1:10,000 to 1:20,000 in scale and were only digitised much later, meaning there could be substantial errors in their positioning. A further complication is that the types of site protected by law in Sweden have changed somewhat over the last century, as has the terminology. This means that some of the places in the Site Register should be marked as protected but are not, whereas others are incorrectly marked as protected. The Site Register is used by many different groups of people and sometimes for contradictory reasons: for some it is to get information about what developments are legally permissible in a given area, and for others it is an invaluable source for research about ancient land use and social development. Balancing these conflicting needs can be a challenge. Not all of the current quality issues can be corrected within the DAP programme, as some would require actual fieldwork and time-consuming manual correction of a large number of sites in the Register. In cases where accuracy or quality cannot be corrected within the scope of the programme, we will therefore focus on developing how information is presented to various user groups through the graphic interface, to make these quality issues clearer. A preliminary study by the NHB made it clear that there was great need for a comprehensive approach to the heritage management process wherein archaeological information is produced, used and archived (Krantz and Smith 2013). The initial phase of the DAP programme therefore involved looking into the entire process, identifying the prioritised user groups and what they most needed to do their work, as well as parts of the process where information was lost or unnecessarily re-digitised. We identified five main areas that are connected in theory, but dispersed in practice (Figure 2). 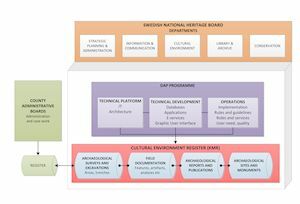 Figure 2: The Cultural Environment Register, Kulturmiljöregistret (KMR), is being developed by the DAP programme. While information may be stored in different databases "beneath the surface" the posts will be interconnected through links. A system is also being developed to receive some information machine-to-machine from the County Administrative Boards. Site info: Historic and prehistoric sites and monuments in the landscape, their characteristics and preservation status. The Register is managed by the National Heritage Board's Information Division. Fieldwork info: Surveys and excavations done where, when and by whom. Areas covered in the landscape. The case files and documents are archived by 21 different County Administrative Boards, but there is no central archive or publicly available map. Reports and publications: Printed copies of reports are sent to the archive of the National Heritage Board. PDFs have been available online from 2013 onwards. Other publications (i.e. scientific and popular articles) written as part of a project, are noted on a form sent to the local County Administrative Board and to the NHB. Digital field documentation: The databases of features and finds, often georeferenced. Kept by the archaeological contractors, which in Sweden include a number of museums, foundations and private companies. Some of these have over time discontinued their archaeological operation. Artefacts: Stored at a local, regional or national museum. Registered in the museum collection database, only some of which may be available online. Together these parts form a complete picture of what has happened where and what the results were. However, anyone wanting to piece them together needs to access several different archives and registers, which are not always up to date. When found, the information may have to be re-digitised, which can be even more time consuming. Moving from information gathering to analysis and synthesis is therefore severely hampered by the current system. 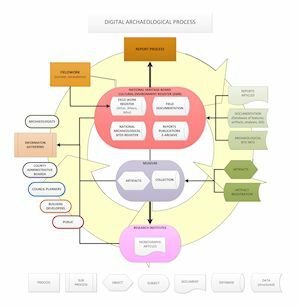 The DAP programme will be developing new services as well as improving existing ones in order to create a more seamless digital archaeological process. Information that is created digitally should be kept as such and made available as publicly as possible and the areas outlined above need to be interconnected to a much greater extent. We are calling this new comprehensive solution Kulturmiljöregistret (KMR) – Cultural Environment Register (Figure 1). The prioritised user groups for the KMR are the County Administrative Boards, archaeological contractors and property developers. However, meeting their needs will also benefit many other user groups, from researchers to the general public. Below is a presentation of the different registers, archives and e-services that together make up the KMR. Newly discovered sites are registered by the National Heritage Board after being reported by the archaeological contractors, after which they receive a formal name (Parish + Number, e.g. Hubbo 73) as well as a unique object identity. Up until recently this notification was done on written forms. Currently there is an online web form, but the NHB registrars still have to transfer the information into the proper Register. The process is time consuming, resulting in reports being printed before the new site number can be included. Up-to-date information on any surveys and excavations done involving known sites, or status reports on any other types of damage that may be found during an inspection, should also be included. This is not consistently reported, however, and even when it is the extensive backlog means the information is rarely added. In order to make sure the Register is up to date, DAP is developing a new tool for contract archaeologists to register information directly into the database during fieldwork. County Board administrators will inspect and approve the registration before it is made public, much as they today approve of the forms sent in to the NHB on their behalf. The tool will also help to make sure that registrations by archaeologists contain all the required information, the correct terminology and are of comparable quality. In order to do this we are developing the graphic interface to make sure obligatory information is included, and that it is described according to national standards. Just as importantly, we are also working on the NHB rules and guidelines concerning site terminology, as well as developing courses that archaeologists can take to be approved as registrars. As much as possible, these courses will be given online to make sure the process is smooth and flexible. Another aspect of the development of the Site Register is to make it easier for users to search and download information for analyses of various kinds. This includes not just archaeological analysis of landscape use and social development through GIS, but also the kind of statistical information important for overseeing and evaluating cultural environment and heritage management. Information on excavations and surveys will be documented in KMR as a part of the digitised process that DAP aims to establish. An archaeological project often involves a larger area than the actual sites found through a survey or affected by an excavation. While the Site Register can tell you where the identified and protected sites are, it is important for people involved in both development and decision making to know if any surveys or exploratory excavations have been done in the vicinity that yielded no ancient remains. Sometimes these projects show that an area is so damaged by historical development that it is unlikely anything is preserved, minimising the need for further archaeological exploration. Knowing where and when surveys and excavations have been carried out also informs administrators and researchers alike about the proper way interpret the distribution of sites seen in the Register –an apparent empty area may simply reflect the fact that it has not been surveyed in a long time. Therefore a completely new Fieldwork Register is being developed, where both surveys and excavations will be searchable and visible on a map, just as with the ancient sites. 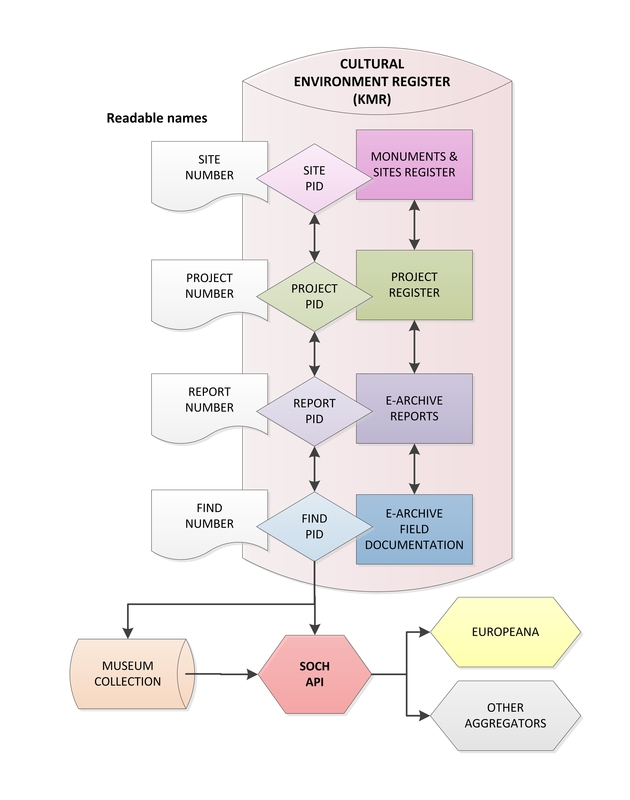 For each project the register will display basic administrative information with links to where further documentation and publications can be found, which museum holds the artefacts, as well as links to the sites that were affected by the project. The project will be shown as a geometry of the area it involves, as well as geometries of any trenches dug to facilitate any follow up excavations by new contractors (Figure 3). The more detailed results, such as features and finds, will not be displayed here – see Fieldwork Documentation below. Figure 3: The Fieldwork Register part of KMR is now under development. This is one of the models made by the graphic designers. These are used first to test if the product will be user friendly and meet our requirements, and only then for the programmers to build from. While the Project Register is developed with the future in mind, the DAP programme has also made a concerted effort to import already finalised digital projects into the register. Older non-digital projects will have to be added at a future stage since digitisation of printed information falls outside the scope of the current programme. Reports and other publications from the projects are invaluable information for administrators, archaeologists, researchers and the public. This is not just because the reports document an individual site, but also because they are needed for administrators and archaeologists planning further projects in the same region or on similar sites. In Sweden the major excavations are expected to produce, apart from the standard report, a research synthesis that can be printed either as part of the report, as a standalone publication, or as papers in research journals. Additionally, it was recently decided that major excavations are to produce a standalone popular summary of the results aimed at the public. While the NHB has had a public online archive of the digital reports since 2013, there are a large number of PDF versions available on museum and company web sites, and even more are stored on their individual servers. Over 22,000 digital reports exist, according to the survey done by the DAP programme, only a small percentage of which are currently available on the NHB Open Archive (Törnqvist 2016). Another issue is that the web search function of the NHB Open Archive has not been optimal. Professional archaeologists often wish to find reports from a certain area (e.g. town, parish), a specific site, certain types of sites (e.g. metal-working sites, Bronze Age burials), or types of projects (e.g. surveys). The public, on the other hand, wants an easy way to find the popular summaries of excavations done in their region. Another aspect of the programme involves the preservation and dissemination of digital fieldwork documentation: databases with georeferenced structures, features and artefacts. While analogue fieldwork records are deposited with national or regional archives, this has not historically been the case for the equivalent digital records. Archaeological contractors are required to submit their documentation for archiving and public access in order to fulfil their obligations to the County Administrative Boards. However, in practice, digital documentation is not handed over in this way owing to the lack of a digital infrastructure within the sector: there is no digital archive to which one can submit fieldwork documentation for preservation, so no digital documentation is submitted. As a first step towards collection of already existing digital documentation, an inventory of records held by museums and contractors was carried out in 2015 (Törnqvist 2016). The results were promising: most contractors seem to have stored relevant data on their servers, and it appears that comparatively little documentation has been lost – although few organisations had any form of long-term digital preservation strategy. Furthermore, fieldwork records seem to be limited to a manageably small number of GIS and database formats considering that the data in question span some twenty years of archaeological fieldwork practice. Crucially for any planned future work, the response rate was high, the overwhelming majority of those surveyed were cooperative, and most expressed an interest in taking part in any future data collection exercises. In total, the inventory listed c.18,000 extant projects with fieldwork data, and c.22,500 with digital reports (including some grey literature reports from privately commissioned field surveys). Collection of these data – and associated metadata – began in the spring of 2016 and is set to continue into 2017, with the aim of gathering in at least half of the material brought to light by the previous year's inventory. The work is carried out in collaboration with archaeological contractors and museums, who are compensated for their time in collating and packaging their data for delivery. The reports and data will be archived and published through a new long-term digital repository at the NHB, and linked against their corresponding fieldwork records in the KMR. All of the data collected will be licensed under the Creative Commons: CC0 for the fieldwork documentation, and CC-BY for the written reports. As with sites and monuments in the register, excavations and field surveys will all be assigned permanent URIs (i.e. PID, Figure 4), will be described using RDF, and semantically linked to related objects both within KMR and externally. Figure 4: Persistent Identifiers (PID) for important units will be created in the Cultural Environment Register. PID will make sure that these units will not lose their connection with each other, and that they can be traced regardless of where they end up in the future. Users will rarely see the PID itself, as it is connected to a name (number, title) that is more legible for humans. The database content will be made available through open access API (Swedish Open Cultural Heritage, SOCH), that can be used by anyone to develop new applications. Although the number of different file formats represented in the fieldwork data is small, it is nonetheless diverse and includes some proprietary formats, a small number of which constitute the vast majority of the corpus. The question of how to archive and publish this material in a sustainable manner that is accessible to all therefore presents something of a problem (cf. Löwenborg 2014). The intention is to require all new fieldwork data deposited under DAP's digitised process to conform to a particular set of open file formats and package structure. This will facilitate archiving and dissemination for new datasets, but does not help us with existing ones. All fieldwork data and reports will be stored in a new digital repository, and in the long term we would like to migrate all existing data to open formats for preservation and publication. However, this will be a large undertaking, so initially we simply plan to publish the collected data 'as-is' in whatever format it was received; there is a value in making the data freely available, even if not all those who would like to make use of it can do so initially. While excavations produce documentation that can be stored and shared digitally, they also often yield physical objects that need to be stored and cared for: artefacts, osteological material etc. These are usually the only original parts of an archaeological site left for further research and analysis. They are a fundamental responsibility of museums to preserve, exhibit, communicate and research. It is the NHB that decides if the finds from an excavation should remain at the national museum or if the ownership can be transferred to a regional museum. The process is drawn-out, since no final decision can be made until the report is finished. Even after the report is done it can take a long time to reach a formal decision. For most of the 20th century this was less of a problem, as the archaeological units either belonged to a national or a regional museum. This meant that the finds were stored in a museum collection almost immediately, and the finds usually ended up with the same museum afterwards. However, the increased number of archaeological contractors not affiliated with a museum, as well as the rising number of excavations, has made the current lengthy process a problem. For researchers it can be difficult finding out which museum ends up with the artefacts from an excavation, as this is not specified in the report. Another problem is that the accession process takes up a lot of time for museum curators. Checking to see if digital and analogue lists match each other, not to mention if they match the actual content of the boxes delivered, is time consuming. Finds registration by field archaeologists is not always up to the standards used by the museums, or the system in question may have changed over the years between excavation and accession, meaning the curators often have to re-register the finds. DAP is collaborating with the Swedish National History Museum to develop a new process that will speed up the process, facilitate accession and make certain the finds can be traced from excavation to museum and back again. Apart from using the information stored in the Cultural Environment Register to make the decision process quicker, the DAP programme will recommend that all find registers are to include persistent identifiers (PID) for each post. The PID, using internationally accepted standards, will make certain that finds can always be traced from an excavation, to a museum, to a site and context, and back again (Figure 4). Even if finds are dispersed to different museums, or are moved to another museum at some time in the future, the PID makes sure they are always traceable. Another important aspect is to ensure field archaeologists make better use of international standards of registration developed for museum collections, specifically SPECTRUM. This would ensure the accession process is quicker by removing the need for museums to re-register the finds (Riksantikvarieämbetet 2016c). Introducing PID and SPECTRUM earlier in the archaeological process will also be beneficial for SOCH (Swedish Open Cultural Heritage), the national aggregator of cultural heritage databases developed by the NHB. SOCH connects the collections of many different museums and delivers Swedish heritage data to Europeana. The aggregator has an open API, which is developed to enable the creation of advanced search applications by any third party wishing to do so. The DAP programme involves more than just developing new technical solutions and e services. The new system will also lead to new guidelines and regulations and new ways for people to perform their jobs, whether at the National Heritage Board, museums, County Administrative Boards, other government agencies, or for the archaeological contractors. In order to make the new system functional, in practice as well as in theory, the programme is continuously in communication with representatives from these groups and involving them in both decision making and testing of the products. We do not underestimate the fact that a more streamlined archaeological process, with better quality and efficient sharing of information, is dependent on the people contributing, creating and using the information. The DAP programme will therefore also develop courses and web-based educational tools. This is especially important as in the future most of the registration in KMR will be done by external users, mostly archaeologists and County Board administrators. While these users are very competent within their own areas of expertise, the national registers require knowing how to use specific terminologies and standards, as well as an understanding of the laws and regulations governing different parts of the heritage process in Sweden. Focusing on the people involved in the process as well, and not just on the technical solutions, will create a better foundation for preserving and developing heritage information. Figure 5: Our vision of the digital archaeological process. The information produced through surveys and excavations is not meant to be simply stored in an archive or a collection. We preserve it in order for it to be actively used by archaeologists, researchers, heritage managers and the public in order to create syntheses, new knowledge and a better understanding for how to proceed the next time. The DAP programme will hopefully make this process easier and more effective for everyone. Finally we want to emphasise that the guiding principle on digital data for the National Heritage Board is openness. As pointed out above, as far as possible all documentation in the Cultural Environment Register will be published as either CC-BY or CC0. The API for the Sites and Monuments Register is already available to anyone wanting to build their own applications using the information therein and we will work to improve this further. The DAP programme will not be able to meet all the needs and requirements of the many different user groups of heritage data. However, we will be able to offer researchers and developers tools and data to create their own solutions. The stated mission of the National Heritage Board is to make sure that the heritage is 'preserved, used and developed'. Through the DAP programme all these mission goals will be met (Figure 5).